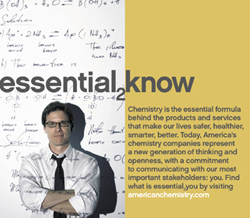 In September 2005, the American Chemistry Council (ACC), the trade association for the world's leading companies engaged in the business of chemistry, launched a major public education campaign to increase awareness of the chemistry industry's contributions to modern life, from innovations in everyday products to its contribution to the U.S. economy. The educational campaign demonstrates how the American chemistry industry is essential to (“essential2SM”) safety, health, innovation, the economy, and the environment. The campaign encompasses advertising, public relations, a new website, and employee communications. A central feature of the campaign is a new website <www.americanchemistry.com> highlighting the industry’s contributions to technological advances and economic performance. The site also demonstrates the economic contributions of the industry to each state, including employment, exports, and tax data.